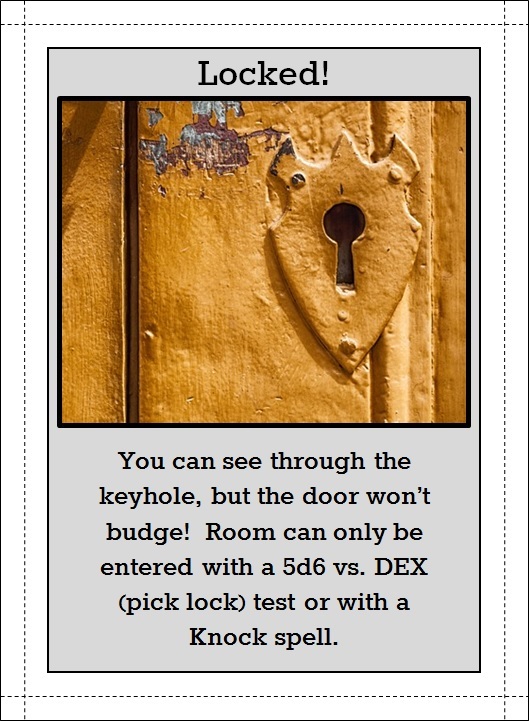 Monstrous Matters: Dungeonstack A to Z: Locked! Darn it, real life! Why must you intrude on my nerdblogfuntime?? I've determined that my preferred way of handling skill/attribute checks in this game...and potentially any OSR gaming I manage to run anytime soon...is the good old Xd6 roll-under-ability-score. So anyone will have a chance to overcome this...but Mages with a Knock spell, and hopefully Rogues/Thieves with lockpicking skill will have a better shot at it. At any rate, 5d6 might be too onerous a task to be any fun, but I hope to see that as I test it out. As always, thanks for checking this stuff out, and hopefully I'll be back later today to get fully caught up to the halfway point of the A to Z Challenge...!